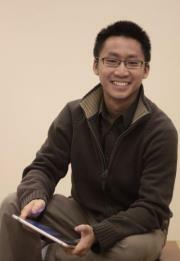 Chi Yan Lam is an educational researcher, program evaluator, and an aspiring evaluation theorist in Kingston/Toronto, ON, Canada. A program evaluator by trade, researcher by education, a social entrepreneur by chance, and an artist at heart, Chi Yan exploits the transformative potential of evaluation in supporting strategic decision-making for social change. He specializes in developmental, collaborative, and participatory approaches of evaluation that help clients navigate the decidedly complex, dynamic, and emergent space of social innovation and human services. As a scholar, he is interested in program evaluation theory, classroom assessment, and professional learning. Chi holds a Bachelor of Arts in Music, a Bachelor of Science (Honours) in Life Sciences, and a Master of Education in educational assessment and evaluation. He is currently pursuing his PhD in Education at Queen’s University. A two-time scholarship recipient of the Joseph-Armand Bombardier Canada Graduate Scholarships Program from the Social Science and Humanities Research Council (SSHRC) at both the Doctoral and Master’s level, his doctoral research explores the intersections of design thinking, program evaluation, and social innovation. Hello Chi, this website looks wonderful… Way to go!